Wordless Wednesday-Who Knew? 20 minutes to the snow from San Diego? What a darling! And how pink! Love it!!! She is lovely! Happy WW! Did you make her that hat under her hood? She’s so cute and pink! Atleast she’s good and warm! 😀 Very cute. Lovely Ladybug, always brings a smile to my face! I tried to comment on the lake picture and it didn’t load via your blog….looks like the lake at the Boy Scout camp we attend every summer. 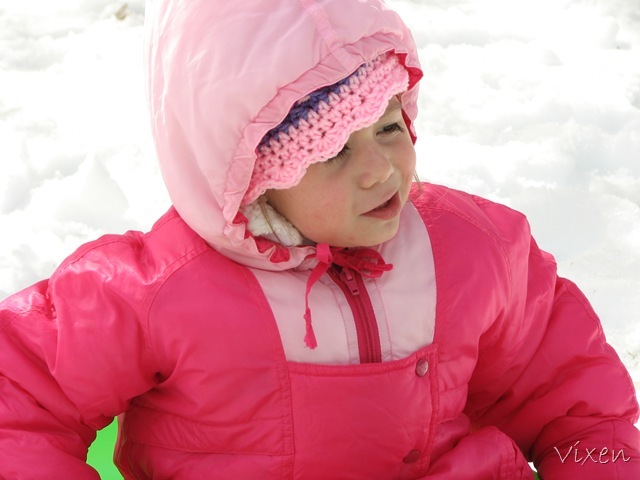 What a great photo – I love the pink snow suit. I love the snow. We got a good dose of it in Canada over the holidays, but it’s been typical British rain since then. What a cheerful looking snowsuit. Thanks for a happy image. This photo is absolutely tops!!! And this is near San Diego? Like in, California [there’s a San Diego in Texas too] —-I’m assuming California tho. Hey now…I hear from song lyrics that it never rains in Southern California…but snow? Lordy. Cute pic, didn’t know you could get snow that close to San Diego. Neat! I love this photo. The pink is wonderful, the baby’s express is wonderful. so pretty in pink … gorgeous. Wow, living in New Jersey and having had ONLY about 4″ inches of snow, I am absolutely amazed and reeking with snow envy! There is my beautiful girl! She looks adorable in that snow suit. And that cute hat you made. Wow, living in New Jersey and having had ONLY about 4? inches of snow, I am absolutely amazed and reeking with snow envy!